Grow chives, scallions, and Egyptian walking onions, or Welsh onions and other perennial onions in your garden for a perpetual harvest of spring onions all summer long. By growing these three hardy perennial onion varieties, you’ll never run out of onions again. Annual bulb onions take a long time to grow. From seed to full bulb can take as long as 6 months to almost a year, depending on the variety. These are winter keeping onions that are the mainstay of the supermarket trade. But when you are growing a kitchen garden you need fresh garden onions from early spring right through the year. Planting perennial onions can bridge the season while you are waiting for your bulb onions to mature. These are the cut and come again green onions with a mild flavor that can be eaten fresh or cooked into soups and stews. 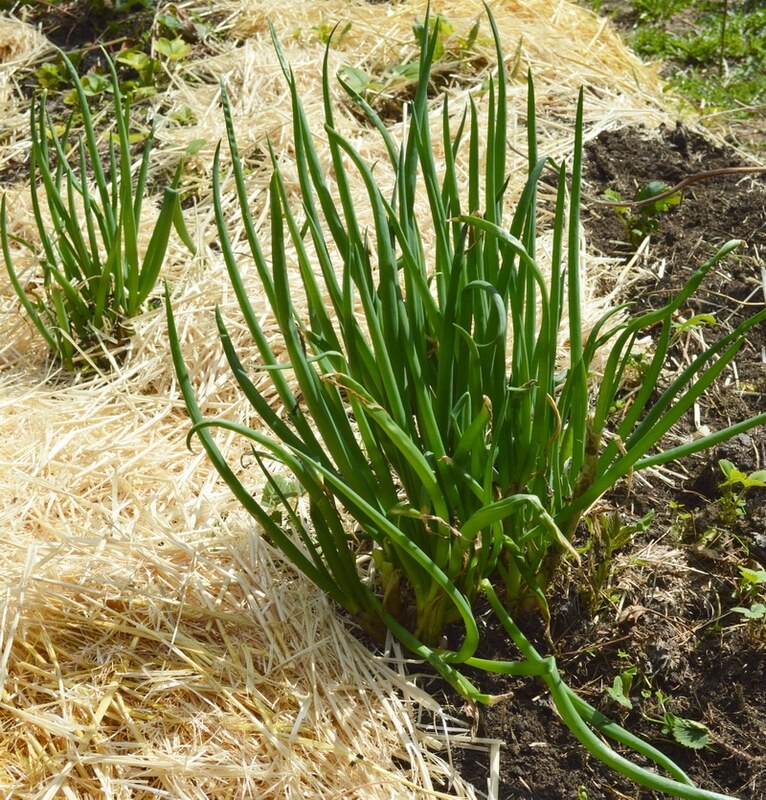 Once these perennial onions are established in your garden, they will emerge as soon as the ground thaws in Spring and give you an early harvest from a few weeks after spring melt right through till the killing frost in the Fall. These plants are hardy perennials that don’t mind the chill. So even if you live in zone 3, give these hardy onions a chance in your own garden. They are carefree once they are established so plant them this year and harvest them for years to come. The flavor is akin to green onions, leeks, or even garlic greens, sweet with a bite. But even though they are mild they will still make you cry when you cut them. Chives are probably the most familiar of the perennial onions. 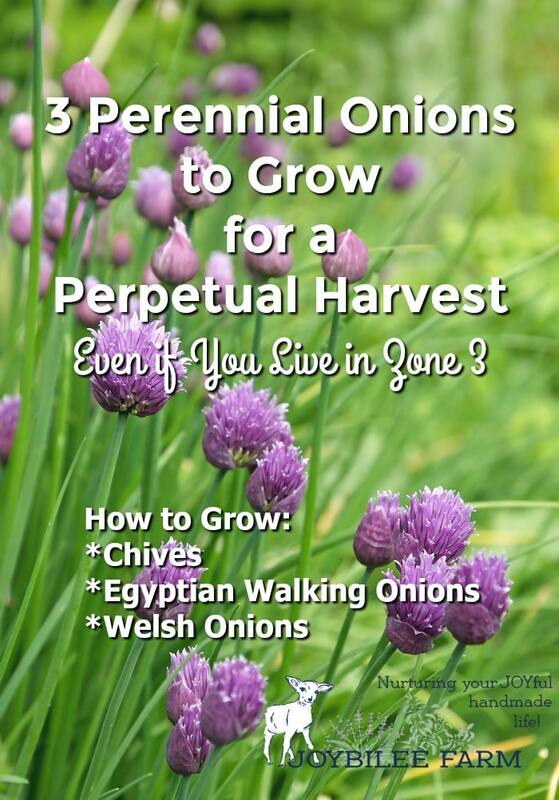 They are hardy to zone 3 and once they are started in your garden, you’ll have a perpetual harvest forever. Chives are hardy perennial bulbs that reach up to 12 inches tall and belong to the onion family. They grow in clumps that are simply a mass of tiny bulb onions. 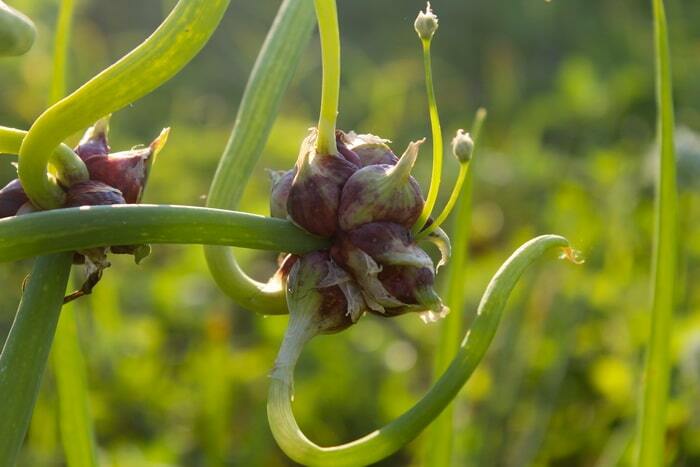 They have a mild onion flavor and are normally eaten by harvesting the tender green stalks while leaving the bulb to continue multiplying for the next season. Common chive flowers are purple, lavender, or pink. Garlic chives (Allium tuberosum) or Chinese chives have the same growing conditions as common chives, but taste stronger and grow to about 2 feet tall. The flowers are white and the stems are flat. Choose an area with fairly moist soil and full sun to part shade. Chives can be started from seed in the spring or prior year plantings can be divided and spread around your garden. Look at abandoned farmsteads and you are sure to find several old clumps of chives waiting to be divided. Easily grown indoors during the winter, you can refresh a clump that is struggling by cleaning up the dried leaves and bringing it outdoors for a few weeks. This gives the plant a blast of winter and when it is brought indoors, it will start growing again. In temperate climates, chives will be evergreen all year long. With mulch protection, you can keep chives evergreen during the winter in mild season areas. They are also a good herb to winter outdoors in a greenhouse or under a cloche. 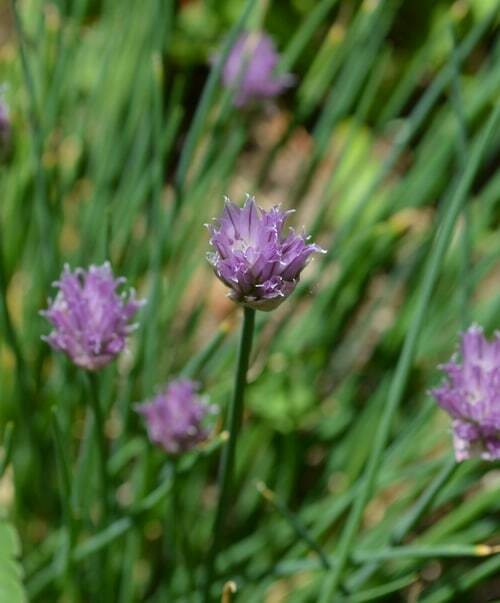 Common chives produce beautiful purple blooms which attract bees and are also edible. The flowers can be sautéed right into the skillet or harvested added to make infused vinegar for salad dressings. Chives are small and delicate, which makes them hard to dry for storage. Consider freezing the green stalks by tightly packing them into plastic bags and then removing the amount you need for cooking. Egyptian walking onions don’t stay where you originally plant them. The green onion part is thick and tall, up to 20 inches tall in fertile soil. And one clump will give you many cuttings of “green onions” with a stronger flavor than chives. I use them in soups and stews just as I’d used bulb onions. Egyptian Walking Onions respond to the shortening days after midsummer by sending up their seed stalk. But instead of flowers, these stalks produce fully formed baby onions at the top of their stems. You can recognize perennial walking onions from these bulbets at the top of their green stems. While they may look like the common green onion plant when the leaves are young, as the plant matures it grows small onion sets at the top of their stocks, instead of in the soil. They get the name “walking onion” because the stalks will bend over at the end of the season and drop the top sets on the ground to become next year’s plants. 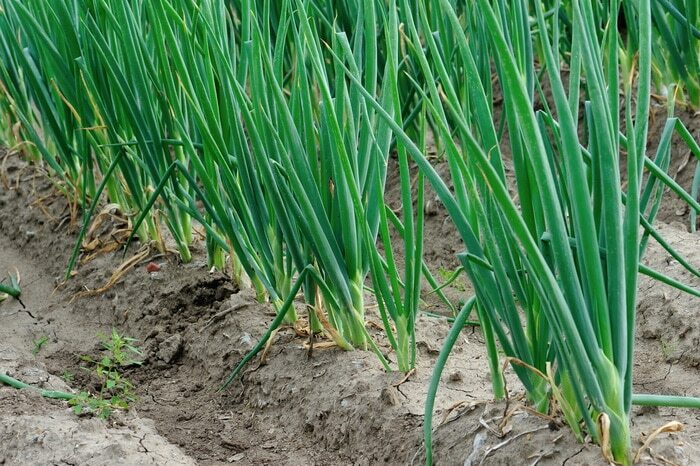 Plant as you would onion sets, in fertile soil that has good drainage. Add plenty of compost and rake the bed so it is smooth. Plant the bulbs 2 to 3 inches apart and 1 inch deep. This is a perennial plant, so any bulbs that are left to overwinter will sprout the following spring. Allow some of the top sets to drop into the bed for new starts the following year. This pungent onion is cold hardy and the leaves work well in soups and salads. Tasting more like red onions than, scallions or chives, there are three parts of the plant that are edible. The top set onions can be chopped and used for general cooking. The immature greens can be chopped and eaten like green onions. What you cut will regrow. Welch onion is an old heirloom variety of bunching onion or green onion. Sometimes referred to as scallions or spring onions, their bronze, red, purple, or white bulbs have a sweet flavor that is good in cooking. The leaves emerge as soon as the weather starts to warm and the plants will get from 2 to 3 feet tall in good soil, in full sun. This perennial plant will not die back until the killing frost. The bulbs and lowest stalks can be made sweeter by hilling up the earth around the stalks as they emerge from the soil in spring, blanching the stalks, and causing them to grow longer before branching into green onion leaves. During the summer Welsh Onions produce 2-inch size flowers that look like white balls. These are edible when they are young, or if left to mature will produce thousands of seeds suitable for growing new plants, or for use as sprouts in the winter months. The bulbs will turn into new clumps each season, so you will never be out of their sweet flavor. Start seeds indoors at room temperature and transplant outdoors after the last frost. Place them in a bed with full fun, where you want perennials to grow. Direct sowing outdoors is also an option. Prepare a seedbed by removing weeds and grass and adding compost or manure. Broadcast the seeds and keep the soil moist until sprouts emerge. Use Welsh onions in soup and dishes as you would green onions. They are commonly used in place of chives in restaurants to garnish soup and baked potatoes. They are fabulous in potato salad or added to any green salad. The stalks can be dehydrated and stored in the pantry for up to a year or frozen as you would with chives. Adding chives, walking onion and Welsh onion to your backyard garden will give you a continuous onion harvest year after year. These care-free perennial onions bring self-reliance to your garden and diversity to your kitchen, with very little effort. Richters Herbs is a good source of seed for perennial onions for the home gardener and commercial grower. Check out their selection of seeds, herb plants, and bulbs here. Perennial onions are also important assets in companion planting in your garden. They repel carrot rust flies and are good companions to carrots and beets. But don’t plant them in the bean bed because beans and alliums don’t grow well together. You can find many Edible Wild Plants of Early Spring to Hunt on Your Foraging Hike so be sure to keep an eye out for these alliums out in the wild then try a few of these Healthy Garlic and Onion Dishes that Might Make You Immortal.